Dr Strand is a doctor who strongly believes that quality supplementation is vital for disease prevention in this day and age. He was also responsible for putting the combination of supplements above together. He has kindly allowed us to display his video explaining how and why he ended his 23 year opposition to supplementation and how he uses supplements for degenerative diseases and conditions such as Meniere's Disease. Of course he plugs his medical practice at the end, but the message he has is very powerful. Click on the video to watch in another window. It is a simple proven fact that many people live free of Meniere's Disease symptoms when taking high quality nutritional supplements, improving their diet and lifestyle. 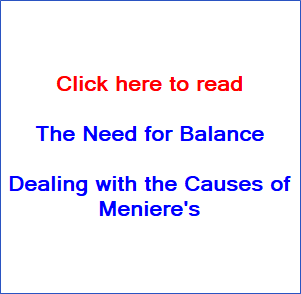 It is by no means the only aspect to dealing with Meniere's but it has proven over many years to be a very effective way to reduce or eliminate symptoms. "As a young man I was quite a serious sportsman. At that time I tried a high street brand of 'multi-vitamins' from the local pharmacy for a few months and was totally underwhelmed. So when I was told that a regimen of supplements could allow Meniere's sufferers to live symptom free, quite frankly I didn't believe nor trust the idea one bit. So much so that it was 18 months before I actually gave in and tried them. To make a very long story short, I very quickly started to feel better. It took a full 6 months for my vertigo to completely disappear but right from the beginning I felt I was getting better. Within a few days the brain fog was gone, I had bags of energy and the dizziness disappeared. I had a few ups and downs along the way but the whole time I could feel the improvement." You can read my whole story here. What do people have success with? We have been using a particular set of supplements for over 13 years. These supplements were recommended by two doctors originally in the 1990's (see below) and to be quite frank you must choose wisely when choosing what you use. 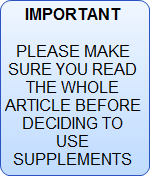 You can find links to the exact supplements used at the bottom of this page. There are quite literally thousands of manufacturers out there and many are very poor quality. Unfortunately, generally there is no regulation from the FDA or other national bodies around the world to guarantee the safety, potency and quality of nutritional supplements . They are classed as foods not drugs and many supplements do not have the exact amounts of nutrients quoted on the containers. In addition to that, many use fillers and binders that are either not useful or are not absorbed well into your body. Some even have harmful ingredients. It is partly for this reason that supplementation can sometimes get bad press. Are there other quality supplements available that can help? Absolutely, but this is just a word of caution. It would be a great shame if you popped down to your local store and bought the first supplements you see on the shelf, they didn't help you at all, then you gave up on the idea. You could be missing a very real chance of helping yourself ease your suffering and live symptom free. Is it a cure or a treatment? No; supplementation supports your immune system in tackling inflammation and therefore keeping you free of symptoms. Given the chance and right support, your own body can be the best doctor. You need to find your underlying root cause to cure yourself but this CAN indeed be done, it has been done by countless sufferers and is being done all the time. No matter what you may have been told or read, there is a cause and you CAN find yours and deal with it. 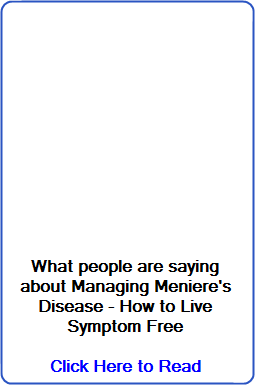 Sufferer have been contacting Meniere's Help for years with testimonies proving this to be so. Click here to learn more. The vast majority of people we talk to manage on the above only. Some occasionally increase the grape seed extract temporarily if they feel an increase in pressure or have any problems. The entire concept behind the use of quality supplements is to help support your immune system through cellular nutrition. For a number of reasons, the average modern diet is often no longer sufficient to do this. A diet high in organic whole foods, low in junk foods and supported with the best possible nutritional supplementation available is the best way to get your body functioning as it should. As a result you can live a more healthy and energetic lifestyle. This is NOT drugs, but high grade natural nutrition, taken from pure concentrated food extracts. That is with the exception of ginkgo, which is herbal. It comes from a tree prevalent in East Asia and has been used for medicinal purposes for thousands of years. You may have heard of the term 'endolymphatic hydrops'. The definition of hydrops is: edema: "swelling from excessive accumulation of watery fluid in cells, tissues, or serous cavities� We have such cavities within our ears. So when you see or hear these terms, �endolymphatic hydrops� or �secondary endolymphatic hydrops� what is being said is you have inflammation (or swelling) inside your inner ear. The inflammation process is a natural biological reaction from your body�s immune system to any disturbance in an area that needs help from the immune system. Under normal circumstances the immune system sends its defenders to deal with pathogens disturbing whatever part of the body is being attacked or disturbed. The swelling occurs when a surge in oxidation takes place as a result of the frantic activity of your inner defenders and all the excess energy produced (creating what are called free radicals - like a fire spitting out sparks). Your body�s supply of antoxidants cleans up the mess and gets that part of the body back to normal as your new cells are regenerated healthily. In medicine, there is a term called �silent inflammation�. This is when the inflammation process goes on for over-extended periods of time unnoticed. The body�s supply of antioxidants cannot keep up with the demand and it starts getting messy in there. This is how degenerative diseases and conditions can occur. Your body is losing the inner battle and the inflammation becomes chronic, creating degenerative disease states. Studies have shown that systemic inflammation is involved in at least 22 serious health conditions, from heart attacks to arthritis, diabetes to Parkinson�s disease. So what we need to stop this happening are two things: First, we need to look at what is the source of this resulting inflammation, ( something we have spent over 8 years researching Click here to learn how to do this) and second, how can we make sure the body can keep up with the demand for antioxidants needed while this silent inflammation is taking place. The second part of this equation would explain why using high quality supplementation, which provides potent antioxidants, helps Meniere�s sufferers keep the symptoms at bay. In most cases it might not address underlying root causes but it does deal with the resulting cause of the symptoms. It supports your immune system enough to reduce or stop the inflammation occurring. It strengthens your immune system and makes it more efficient. Add to this a diet high in antioxidant fresh fruit and vegetables and you are giving yourself a much better chance of enabling your immune system to deal with your hydrops. In most cases it may not address the underlying cause, but it depends from case to case. We are all different and have different causes and triggers. For example if your underlying cause were related to neck misalignments then the supplements could supply the antioxidants needed to keep the inflammation at bay but to get to the root of the problem you would need chiropractic manipulation or something similar. On the other hand if your cause was related to endochrine imblances then the correct diet and appropriate supplementation might be exactly what you need to get to the root of your symptoms. A quality supplement regimen can aid and balance your immune system and cleanse you of toxins, allowing your body to take care of itself. The need for a multi-vitamin/mineral for everyone regardless of their condition is now accepted to be 'prudent'. This was the term used by a formerly reluctant AMA when forced to accept that supplementation was needed after studies by two Harvard doctors showed this to be the case....these are the 'essential' vitamins, minerals and cofactors needed by the body to function as it should. In a perfect world, we wouldn't need supplementation. Unfortunately though, for a myriad of reasons this is not a perfect world when it comes to our health, what we eat and what enters our bodies. This is discussed in more general detail on the page: The Case For Supplementation. The specific antioxidant formula we have used with success for many years has all the vitamins and co-factors you need and their role is discussed above. The minerals work in synergy with these vitamins, just as they would when found naturally together in whole foods. Calcium helps transport oxygen through the blood around your body and in synergy with magnesium and vitamin D helps keep the tiny bones between your middle ear and inner ear from rupturing (it has been suggested that this can happen when there is a vertigo attack). Gingko helps blood flow to the peripheral blood vessels especially around the brain area (very important for Menieres). It is also a powerful antioxidant. The Bioflavonoids and high dose Vitamin C combination is perhaps one of the most important elements. Grape seed extract has very powerful anti-inflammatory properties. Again packed with antioxidants. It also promotes cardio vascular health, resulting in healthy blood flow. Both Ginkgo and the bioflavonoid/Vit C combination are packed with flavonoids. Flavonoids are compounds that are found in fruits, vegetables and certain beverages. Both the Linus Paul research institue at the University of Oregon and The University of Maryland Medical Center have stated that they can be beneficial to Meniere's sufferers. They have been reported to have antiviral, anti-allergic, antiplatelet, anti-inflammatory, antitumor and antioxidant effects. Certain types of flavonoids, especially the group of flavonoids known as hydroxyethylrutosides, may improve symptoms associated with Meniere's disease, including stabilization of or improvement in your hearing. The effects of other types of flavonoids on Meniere's disease have not been studied. Lipoflavonoid is also packed with flavonoids and has been used with success to reduce symptoms. Tinnitus appears to be one of the most difficult symptom to reduce or stop. When sufferers have added Lipoflavonoid to the original regimen many have reported success in eliminating or reducing tinnitus. ENT doctors and audiologists generally insist that once the hearing nerves have suffered damage from repeated Meniere's attacks and hearing has been lost, it can not be regained. Results of Meniere's sufferers on supplementation over the years contradicts this 'theory'. Read about restoring your hearing here. A study into the effects of anti oxidants on the auditory nerves also suggests that supplementation can result in improved hearing. This work was supported by the European Union Biotechnology Research Program (QLG3-CT-2002-01563), the Swedish Research Council, the Foundation Tysta Skolan, NIH Grant DC03820, the Ruth and Lynn Townsend Professorship. "After being treated with doses of antioxdants previously deaf animals regained at least some of their hearing." "This study demonstrates in vivo that free radical scavengers, a combination of vitamin E and C, not only enhance SGC survival but also increases electrical sensitivity in the cochlear nerve after deafness." To put it in the simplest possible terms: the belief is, and the evidence shows us, that the supplements are supporting or aiding our body's own immune system to deal with the inflammation in our inner ear more efficiently. Another important factor to note is that dietary supplementation is not mutually exclusive. It works in synergy with a healthy, whole food diet. 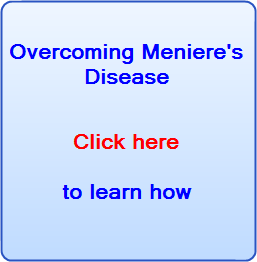 Can Dietary Supplements Cure me of Meniere's Disease? No, in most cases we don't believe so. But as stated above, there may be instances where the root cause may require balanced nutrition as the answer. And we do not look at supplementation as being a treatment either. It is our belief that high quality supplements can help your body deal with the inflammation within your ear and allow you to live symptom free. To cure your Meniere's completely you need to find your root cause or biggest trigger and deal with that accordingly. It can be different in each individual, but it can be done. The supplements can allow you to live normally while you search for your individual root cause. Learn more about root causes how to deal with them here. Why do we use the terms: 'high quality', 'broad spectrum' and 'optimized' when talking about supplements? As stated above there are 1000's of supplement products available in health food stores, pharmacies and online. The quality, safety, and potency can vary greatly. Some are fantastic products with great health benefits, others are less impressive, some are questionable, some a complete waste of time and money and some are even considered to be dangerous. There are a lot of very poor quality supplements on the shelves of health food stores and the like and it is sometimes questionable if the supplements actually contain what it says on the label. They need to have optimum levels of all the essential vitamins, minerals and cofactors, and be perfectly balanced. The manufacturing process of the supplements should be of Pharmaceutical grade, manufactured under the same strict regulations as drugs for medicine. This is something that is not required by law, but a handful of companies volunteer to be regulated this way to prove the quality, safety and potency of their supplements. With these manufacturers you know exactly what you are getting. A good way to find this kind of information and detailed explanations on how cellular nutrition works would be to check in the " Nutrisearch Comparative Guide to Nutritional Supplements" by Lyle MacWilliam MSc, FP. You can get the most recent guide (5th edition) here: Comparative Guide To Nutritional Supplements (there may have been new editions published since the time of writing which you will find through the above link. Consumerlab.com found that over 40% of supplements tested had serious defects. The supplements we use are consumerlab certified. Biologically speaking, everyone is slightly different. In terms of how fast results happen from taking these supplements, it can seem like we are very different. Most people see results within months, weeks, or even days. While with others it may take longer. It may depend on the severity of the condition, the origin of the condition, how long they have had it and other possible related health conditions they may have. Doctor Strand says it takes 6 months for the body's immune system to be rebuilt and people should give it six months before judging whether successful or not. Our health generally depends on the condition of the most basic living unit in the body - the cell. Our bodies are made up of around 100 trillion cells that are constantly dying and being regenerated; being replaced by new cells. These cells need to be kept healthy in order for us to stay healthy. We keep them healthy by feeding them. If the cells are not getting the right amount of nutrition, clean water and air they are unable to function as they should. �It has been established that the two most common causes of diseases are: 1) Lack of fuel to the cell - in other words lack of vitamins, minerals and trace elements. 2) A reprogramming of the cell�s control system e.g. in viruses and diseases such as cancer.� Dr L. Bannock. If the body�s nutritional needs are constantly met then each cell will be replaced by a healthy new cell and in turn the immune system will be strong, resulting in the proper function of our organs. With the right nutrition unhealthy cells will be replaced by healthy ones. In summary, strong antioxidants provide extra �fighting power� to the immune system, neutralizing free radicals and acting as very effective anti-inflammatories, drawing away unwanted fluid from the cells. In our case the cells in and around the endolymphatic sac. This is why the correct "quality" supplementation helps our bodies stay symptom free. *NOTE* The links on this page are for The USA & Worldwide. For links specifically for Canada & The UK connected to this page please click here and a separate page will open for you to cross reference while you read. The list below is described in generic terms but the links will open up to the exact products used. Many people regain their hearing while on these supplements, something that is deemed impossible by some ENT doctors and audiologists. That said, we do commonly hear variations of, 'no more severe symptoms such as vertigo, increased energy levels but hearing still impaired.' This could be a result of previous surgery or in most cases, the hearing nerves have been damaged over a very long period of time. It stands to reason that it may take time to repair the nerves and regain your hearing. It may increase and speed up repairing the hearing nerves inside your ear and regain your hearing by replacing the CoQ10 in Dr Strand's maximum recommendations with something called DNA Force. A real heavyweight, top quality supplement, DNA Force includes high amounts of super antioxidants CoQ10 and BioPQQ, backed by several clinical studies and by more than 175 PubMed listed published studies. It may be that you have success regaining your health using only DNA Force. If this is the case then please let us know all about it. We are now collecting testimonials and accounts of hearing returning after using DNA Force. If you have experiences such as this please let us know, so we can advise other sufferers as accurately as possible. You can see some early testimonials by going to this page and scrolling down to DNA Force. Every human cell has a cell wall, a thick cell membrane. Once the integrity of the cell wall is punctured the good protoplasam leaks out and toxins or 'bad stuff' oozes into the cell. The cell then gets sick and dies. Disease states then start to occur. A healthy cell has a strong cell wall to protect the good on the inside and keep out the bad. *NOTE* The links on this page are for The USA & Worldwide. For links for Canada & The UK connected to this page please click here and a separate page will open for you to cross reference while you read.